An inmate who tried to strangle a prison officer with strips of bed linen in an "appalling attack" has been jailed. 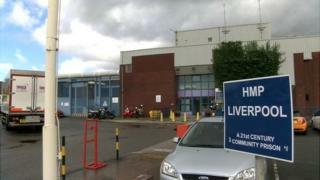 Martin Marland was believed to be under the influence of the drug Spice when he set upon the male staff member at HMP Liverpool in March last year. The 26-year-old admitted attempting to choke, strangle or suffocate a prison officer at Preston Crown Court. He was sentenced to 11 years and eight months on Thursday. Det Insp Mark Drew, of Merseyside Police, said it was an "appalling attack" on a officer who was concerned about Marland, who had been behaving erratically. He was seen tearing strips of bed sheeting into ligatures before two prison officers entered his cell, the force said. Marland then threatened the officers and leapt without warning towards one officer, wrapped the ligature around his neck and started to squeeze it tightly. The officer's colleagues intervened and managed to lead him to safety. Det Insp Drew added: "It is undoubtedly only due to the quick-thinking interventions of the victim's colleagues that he wasn't killed."